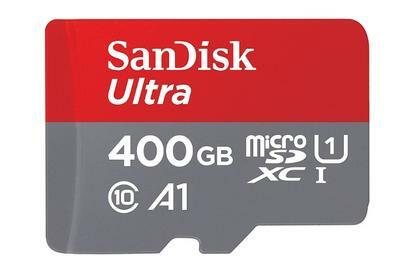 SanDisk's 400GB microSD card packs a whole lot of storage that fits on your fingertip for just $185. If you're thinking of grabbing a Galaxy S9 when it comes out next week, need a super-sized Nintendo Switch storage solution for your collection of games, or simply want to expand beyond your laptop's stingy-sized SSD, Amazon and B&H Photo Video have a great deal today. Both retailers are selling a 400GB SanDisk Ultra class 10 microSD card for $185. That's a great price for a massive amount of storage. Just a few years ago you could only get 400GB capacities in mechanical hard drives or high-priced SSDs. Earlier in March, Amazon sold this SSD card for around $230, and right now Best Buy has it for $240, so you're getting about $45 to $55 off the usual price. SanDisk's card is an especially great option for anyone looking to buy the Galaxy S9, as mentioned earlier, since it can take up to 400GB microSD cards. It would also serve as a superb accompaniment to the Nintendo Switch's paltry 32GB of internal storage. Those eShop games can add up fast! This is a speedy class 10 microSD card, making it a solid choice for games storage or shooting a lot of HD video recording on a phones.The transfer speeds max out at 100 megabytes per second, which is fast enough to transfer up to 1200 photos in one minute, according to SanDisk. If you need a lot of storage but not quite 400GB, the Amazon listing includes various storage capacity options ranging from 16GB for under $10 to 256GB for $110, with a wealth of options in between. They're not discounted anywhere near as heavily as the 400GB model though.